It is funny when the tiny caterpillar of the walnut sphinx Amorpha juglandis suddenly emits a high-pitched noise. Thus sound scares birds, as Amanda Dookie and colleagues witnessed, so that they will refrain from picking the caterpillar. Why are birds startled by this whistling caterpillar? 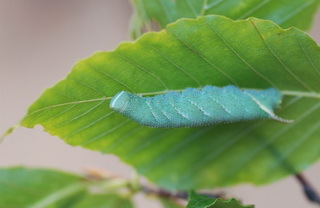 Normally birds are not afraid of a caterpillar, but caterpillars of the moth Amorpha juglandis can scare them, Amanda Dookie and colleagues report, by starting to scream when they are touched – a most peculiar behaviour. A few years ago, Veronica Bura investigated how the caterpillars produce their high pitched sound. Their respiratory system consists of a network of tubes with on each side a row of openings, the spiracles. When screaming, Bura assessed, walnut sphinx caterpillars contract the front end of their bodies, close all spiracles except the rear pair and expulse the air forcefully through these openings, producing a whistling sound. The posterior spiracles are enlarged compared to the others, which probably is an adaptation for sound production. Often the caterpillars also thrash their heads to defend themselves while whistling, and Dookie wanted to know if the whistle sound in itself is enough to frighten birds, and how great the startling effect is. To find out, she exposed a number of male red-winged blackbirds to playbacks of caterpillar whistles that had been recorded before. 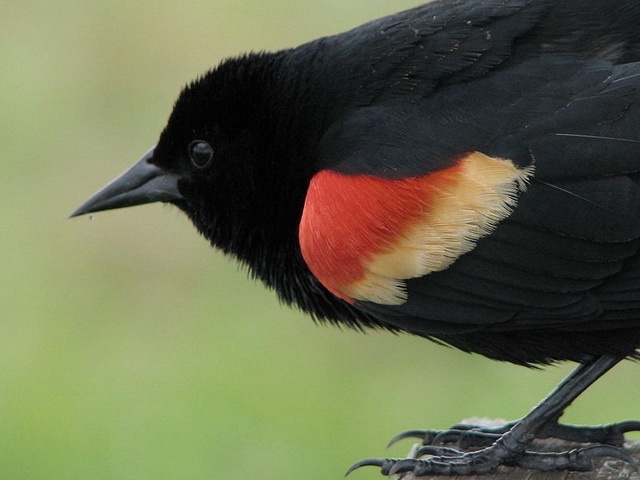 Just like the walnut sphinx, red-winged blackbirds are to be found throughout North America. The experimental birds were housed in individual cages and provided mealworms on a small platform for four days before the tests started. Then the platform was equipped with a sensor and a speaker, and as soon as a bird touched the dish during a test, the whistling sound was played back. That had a huge effect: the sound evoked a startle response in all birds. Most flew away, hopped backwards or clapped their wings. After a while they tried again to pick a mealworm and then they heard the whistle sound again. The birds got habituated a bit and the startle response decreased over time, but when they were exposed to the sound after two days of rest, they were as frightened as they had been the first time. Can the caterpillars protect themselves from hungry birds by whistling? Probably so. In the wild, the birds scurry around and when they are scared by a noisy caterpillar, they will abandon that prey and move on in search of another. But why are birds scared by a whistling caterpillar that is not dangerous or venomous, as far as is known? The birds may associate the short, high-pitched sound with danger, the researchers propose, because the sound is similar to the alarm call that many birds emit when they are threatened. A fright response to such alarm call is hard-wired in birds, and this seems to be exploited by the caterpillars when they mimic the call.